Hey everyone. Travis back with a great way to get around town - the Tampa Water Taxi! That&apos;s right...we have a water taxi - in fact, the Tampa Water Taxi is open 7 days a week and 365 days a year. The hours are Sunday through Thursday, 10:00 a.m. to midnight. and 10:00 a.m. to 1:00 a.m. Friday through Saturday. The Water Taxi offers transportation alternative for inner Tampa Bay, Downtown Tampa, all the waterside hotels and most nightspot locations. Captain Larry can even do pickup service at your waterside home on Davis Island, Harbor Island or along Seddon Channel. Tampa Water Taxi offers many services including: Tampa Harbor sightseeing Tours, Sunset Tours, Plant Museum Trips, Davis Islands Canal Tours, Buddhist Temple Trips, Hillsborough River Eco Tours and Lowry Park Zoo & Eco Trips. For a group of more than 6, on a Friday or Saturday night- guests can enjoy: J Rue! The Comedy Fortune Teller nights for entertainment value. One of the newest tours added, Nightlite Tour of Tampa is a beautiful ride for couples or customers who enjoy a relaxing look at the surrounding lights on the Tampa Bay waterfronts. 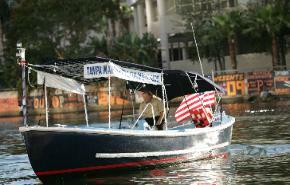 For more information on Tampa Water Taxi Co. tours that are offered, go to http://tampawatertaxico.com/ or call 1-888-665-8687. Believe me, if you haven&apos;t taken advantage of this, you&apos;ll want to. So, go have some fun, and keep checking back here for more great things to do in Tampa Bay, or other Tampa Bay Entertainment options.